Discussion in 'Sports and News' started by tripleoption34, Jun 4, 2011. Second member of the 49ers famed "Million Dollar Backfield" to pass away this year, joining Joe Perry. Tittle is still alive I know, but is McElhenny? Johnson was some player. 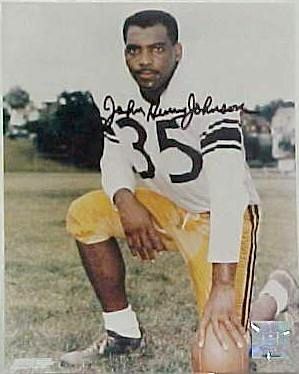 In Esquire's 1965 issue on the violence of pro football, Johnson was one of the players cited as the toughest. The incident chosen to prove this was that in some game in the 50s, an opponent cheapshotted Johnson as he had already been knocked out of bounds, a common practice at the time. Johnson got up and decked the guy -- with the down marker. Iron men and wooden ships. I think he still lives in the Seattle area. From what I understand, Tittle lives in Louisiana and pops up at an LSU game or two during the season.